She is a 9" Tall. Markings are not clear. She has a Shoulder Head Bisque with Smiling Expression, and Blue Intaglio Eyes that are Looking to the Left Side. Molded Lt Brownish Hair Tied with a Rust Colored Ribbon and has a Cloth Body. 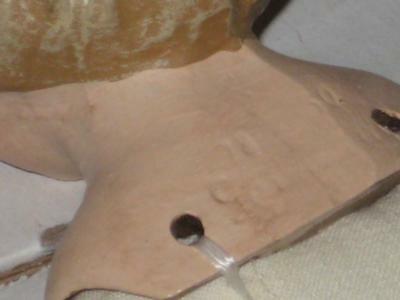 The Doll's Head, Arms, Legs, Feet and Hands have a Rough Bisque Finish. On the Back Shoulder it has Imprinted "Ger than n". Missing the Letters in between. Also, there is a Number above the Letters. Looks Like "79 0". Cannot Identify. Does anyone have any ideas on the doll's manufacturer and age?